Designed to mix a viscous product with the incorporation of a minimum amount of air. Mixing is normally accomplished with the agitator moving slowly up and down within the product. 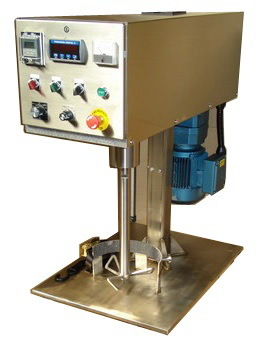 Mixing can also be accomplished with the agitator in the fully lowered position, or at any intermediate height. Agitator speed is variable and oscillation height is adjustable. 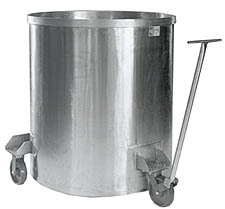 Mixer is all stainless steel construction with adjustable tank holder. Agitator blade can be bow tie type or saw tooth type. Diameter depends on tank size. Keith Machinery can supply a complete line of Stainless Steel Ink Tanks. 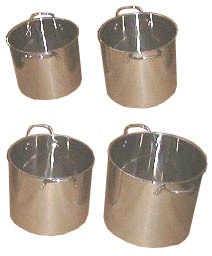 These are available in the following sizes: 1 gal, 2 gal, 3 gal, 6 gal, 12 gal, 20 gal, 30 gal, 50 gal, 70 gal, and 100 gal. Please click onto this site for photos and more information regarding these ink tubs. The photo on the right shows examples of 1gal, 2gal, 3gal and 6gal ink tanks. Keith Machinery manufactures a complete line of disperser tanks. These are normally supplied as tanks on wheels, although tanks with forklift channels can also be supplied. These tanks are fabricated with carbon steel or stainless steel contact parts. Please refer to the following table for tank sizes and specification. 100 gal 32" x 30"
150 gal 36" x 36"
200 gal 40" x 40"
250 gal 40" x 45"
300 gal 48" x 48"
500 gal 60" x 48"
600 gal 60" x 52"
750 gal 62" x 60"
1000 gal 72" x 60"
All tanks from 100-150 gal have 14 ga sides 1/3" x 1 1/2" top stiffener 10 ga bottom & 5" wheels 2 straight, 1 swivel with handle. All tanks from 200-600 gal have 12 ga sides, 1/2" x 2" top stiffener, 1/4" thick bottom & 6" wheels, 2 straight, 1 swivel w/handle. All tanks from 600-1000 gal have 10 ga sides 1/4" x 2" angle top stiffener, 1/4" thick bottom. 4 adjustable legs and two lifting lugs.